Note: The following post is sponsored by Simek’s. All opinions and text are 100% my own. Please read our full disclosure policy for more information. Sometimes it feels like I barely have time to breathe, let alone put a healthy dinner on the table. Between the kids’ activities, hubby’s work schedule and my own wacky writing life, I must confess that there are days where the drive-thru lane calls out to me. I try to have a frugal dinner strategy for busy days. 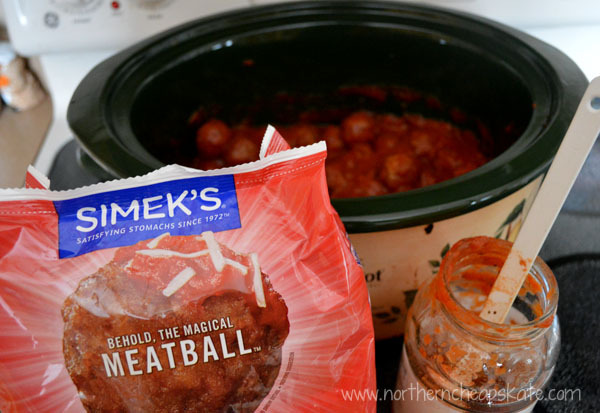 One of the ways I’m making dinner easier is to make sure I have things like Simek’s meatballs in my freezer. Having just one part of the meal already taken care of is a huge time saver. 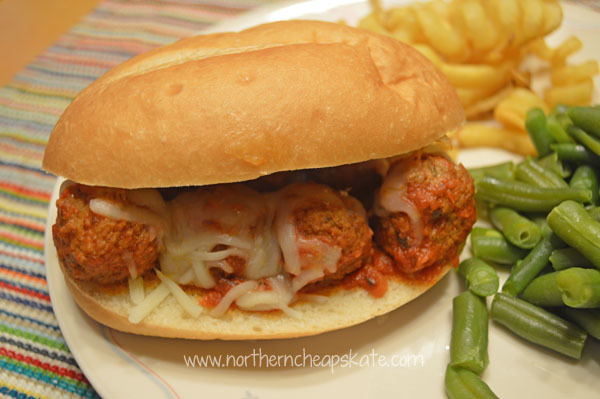 I can skip the drive-thru and my family can enjoy tasty meatball subs with just a jar of spaghetti sauce (bought on sale, of course), some buns and a little shredded mozzarella cheese. I can cook it up on the stove if I’m in a hurry, or throw the sauce and meatballs in the Crock-Pot for just a couple of hours. Then I serve it up with a veggie and a salad or baked French fries, and I’ve got a healthy, protein-packed meal on the table without spending a fortune. And Simek’s products are versatile. You can use them to make all kinds of recipes like Meatball Sliders, Spaghettini, Meatball Marinara Skewers, and Bacon-Wrapped Meatballs. Toss them in soups or sandwiches. Use the mini sausage meatballs in a breakfast bake. 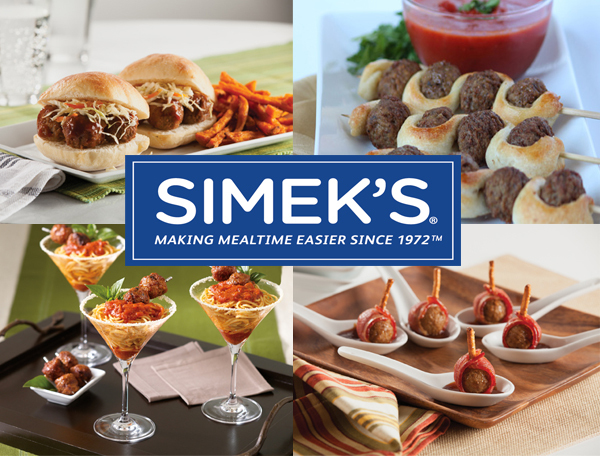 Dinner is easy when Simek’s has the meatballs already done for you. You can find Simek’s products at Target, Cub, Walmart, Sam’s Club, and Lund’s & Byerlys. Don’t these recipes look yummy? And they’re easy! Click on the image to see! While I love the convenience, I also love that Simek’s supports a good cause. For each Simek’s product bought between now and December 31, 2015, Simek’s will provide one meal to Feed My Starving Children (up to 50,000 meals). 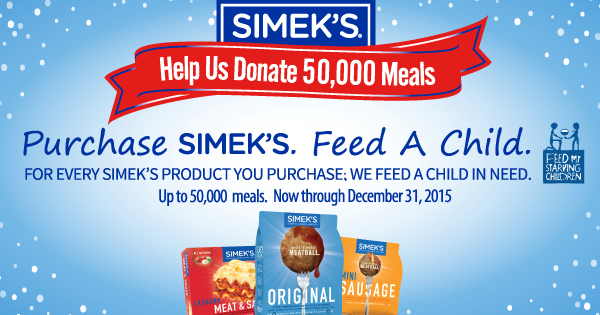 So you are not only feeding your family, you’re helping feed another family when you buy Simek’s. That’s a win-win situation! Print a coupon for $1 off any Simek’s product, then stock up your freezer with the beginnings of a great meal knowing you’re helping another family have a great meal, too! This is a sponsored post written by me on behalf of Simek’s. The opinions and text are all mine. Please read my full Disclosure Policy for more information. 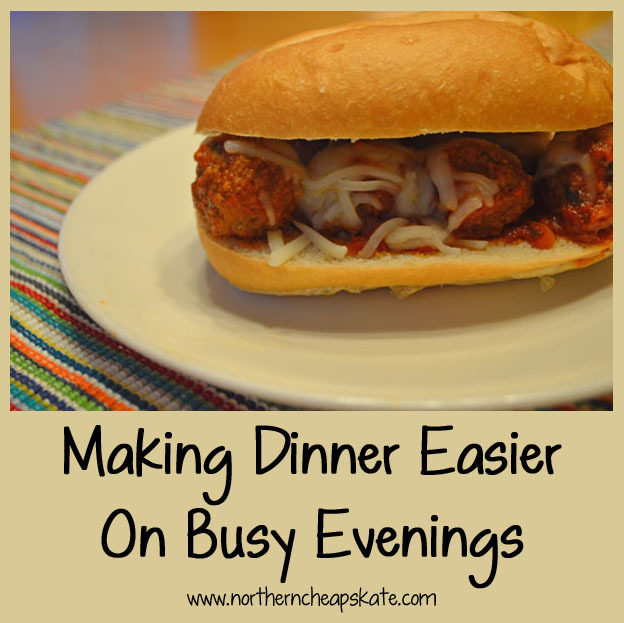 Meatball subs are one of my favorite easy meals!